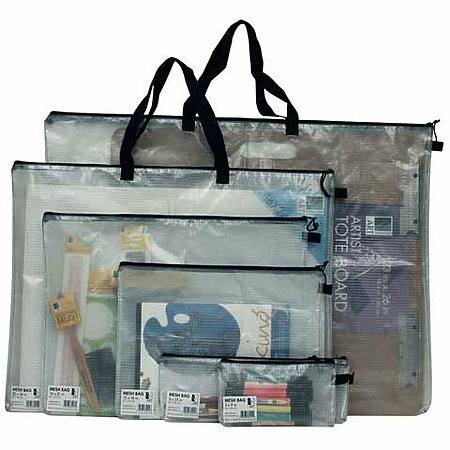 Constructed of durable transparent plastic mesh, these bags allow you to easily see all of your supplies at once while keeping them secure. They feature heavy-duty zippers with nylon pulls that glide easily and keep supplies safely inside. The zippers are stitched, not glued in, for strength and sturdiness over time. Sizes 10" x 14" and smaller have a 3/4" gusseted bottom while the 12" x 16" and larger bags have a 1" gusseted bottom for added storage capacity. The 20" x 26" and 24" x 32" bags feature double nylon handles, long enough to be worn over the shoulder for easy carrying. All sizes include a nylon loop on side of the bag allowing kits to be zip tied for security. Offered in a range of sizes to fit a variety of storage and travel needs.